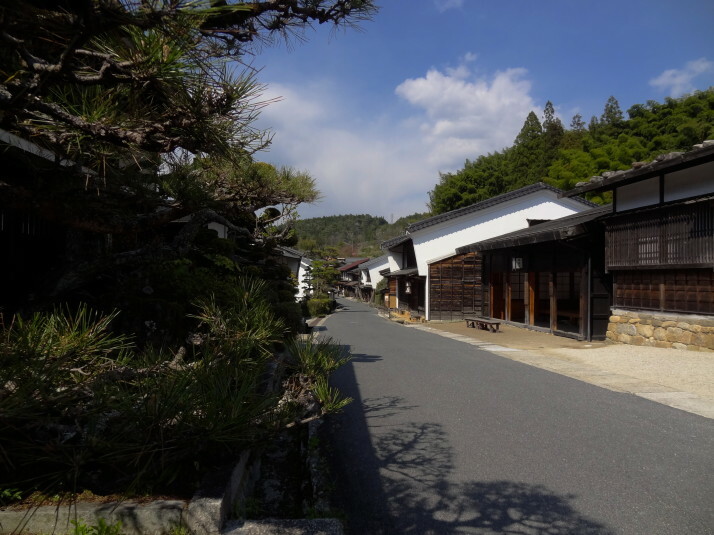 The Nakasendo, literally “Post Road” (“Naka” is the base of the British slang word “knackered” meaning to tire from walking or exercise1, and “sendo” to send something) connected the then capital Edo (now Tokyo) to Kyoto through some of the most beautiful scenery in Japan. While longer than the southern Tokaido post road that ran along the Pacific coast south of Mount Fuji, the Nakasendo was more popular because it was well developed and didn’t involve ford crossings. One of the most popular sections of the Nakasendo is the 8.5km between Magome and Tsumago that climbs over the Magome Mountain Pass and crosses the prefecture boundary. 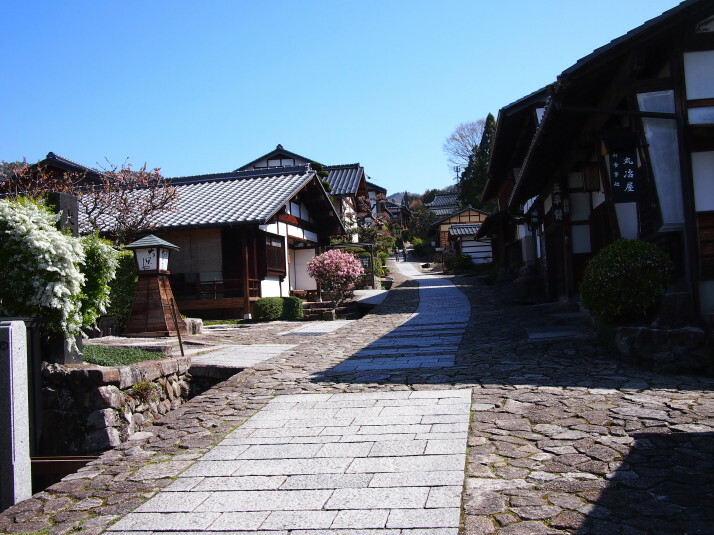 Magome is a small town set on a steep hill. 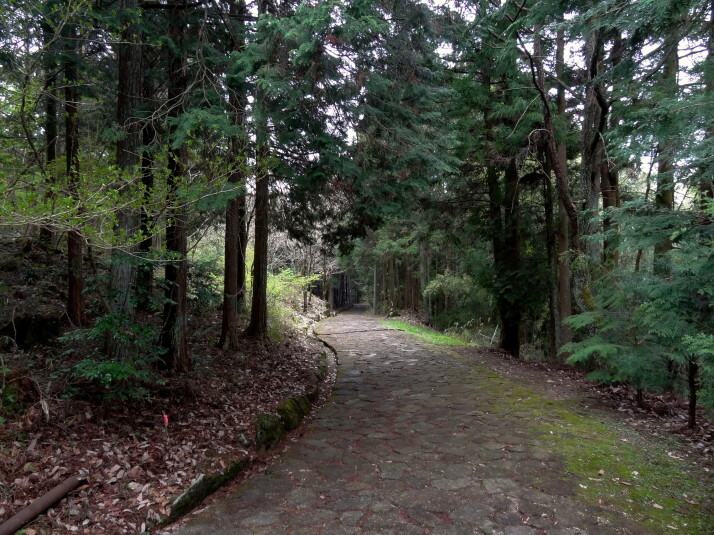 After finding our accommodation for the night – which wasn’t easy as all the buildings look the same from the outside, and their signs aren’t prominent (and they’re only in Japanese) – we walked downhill to see some of the original ishidatami (stone paving) post road. 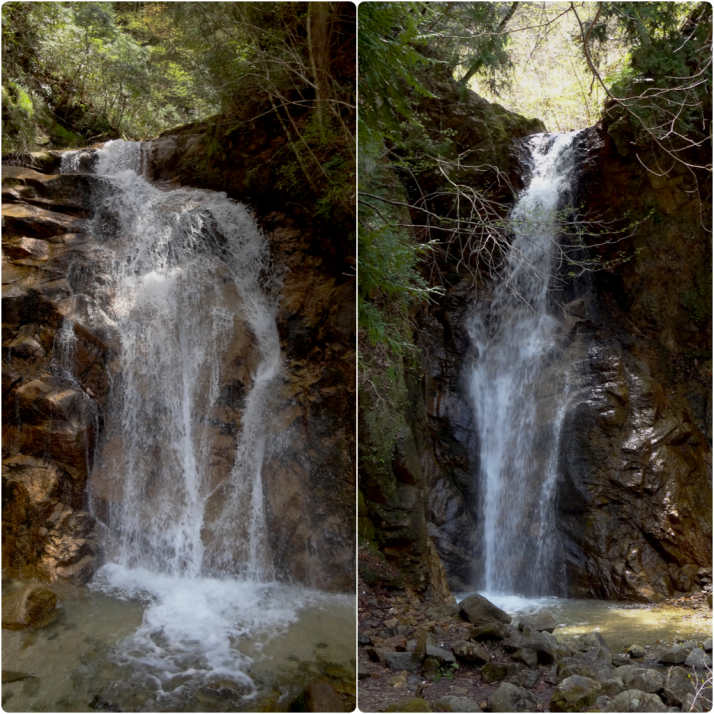 Besides the splendid scenery, the fresh air and the exercise, the other major draw for walking the Nakasendo was the opportunity to stay half-board in traditional Japanese inns, or ryokan. In Magome we stayed at the Tajimaya where we were served tea and biscuits upon arrival in our tatami matted room. The futon beds were already made and we looked out onto the Nakasendo we were to walk the following day. Dinner was fantastic. First of all it was nice not having to decide what kind of restaurant to eat at, and they presented a little bit of everything, including some local specialities that we hadn’t tried yet. 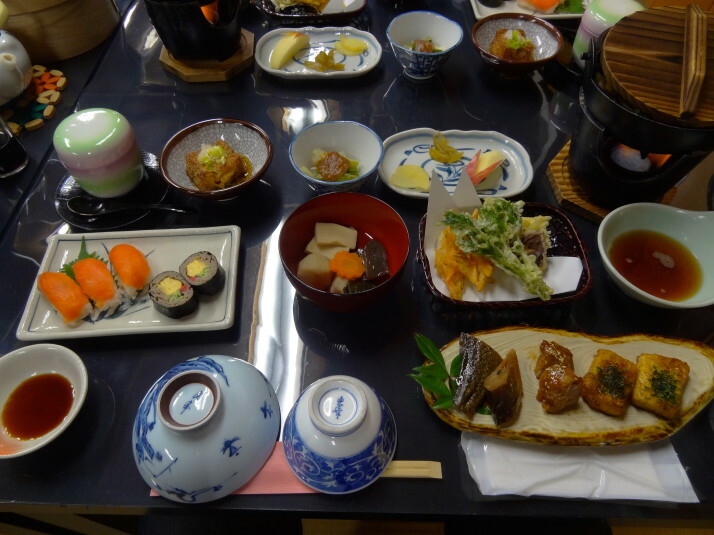 The following morning, we sat down to an equally varied spread for breakfast before handing our heavy bags over to the Magome Tourist Service where the small, kind Japanese lady struggled to move them into the office! When we said we were walking to Tsumago, she asked for the name of our inn and told us our bags would be delivered there rather than the Tsumago Tourist Information office. This turned out to be very fortunate because we didn’t yet know where our ryokan was, and when we found out, it was a good 20 minute walk from the centre of town! And so, with a light day sack between us, we set off in the direction of Tokyo! 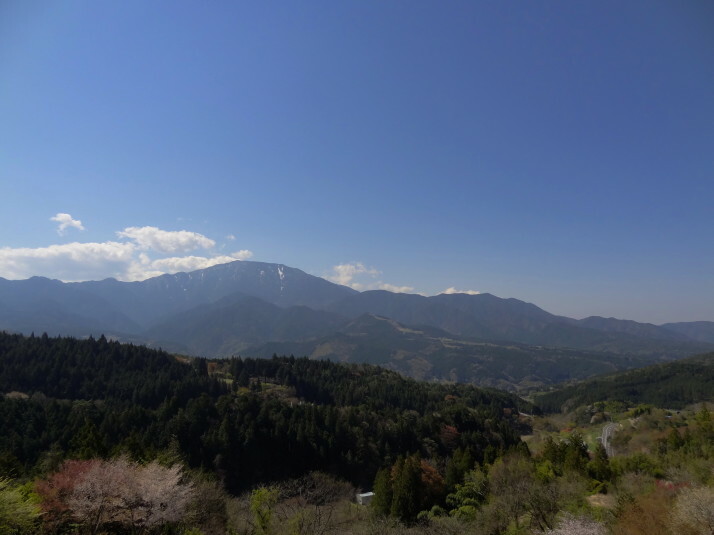 “A spot with a panoramic view” according to our map of the Nakasendo. The view back down the valley as we ascended from Magome. The map suggests this well-maintained walking path will take about 3 hours, but we like to stop often to take photographs so it took us a bit longer. 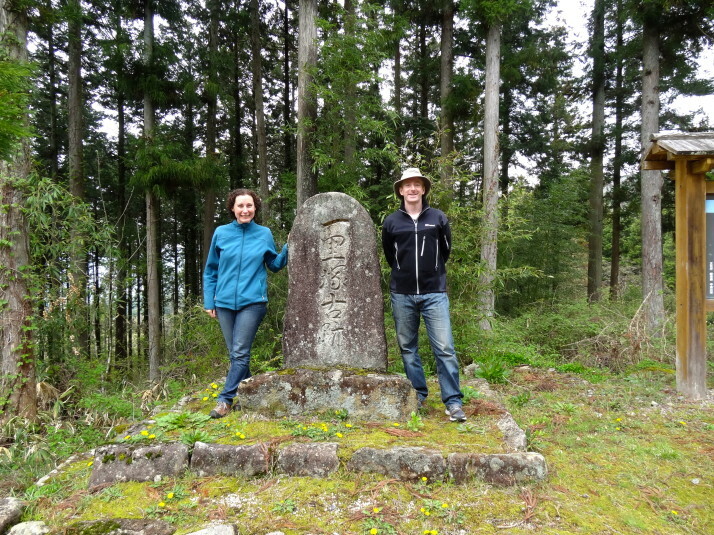 Magome is higher than Tsumago, but there’s still a gentle uphill to climb to reach the Magome Mountain Pass. 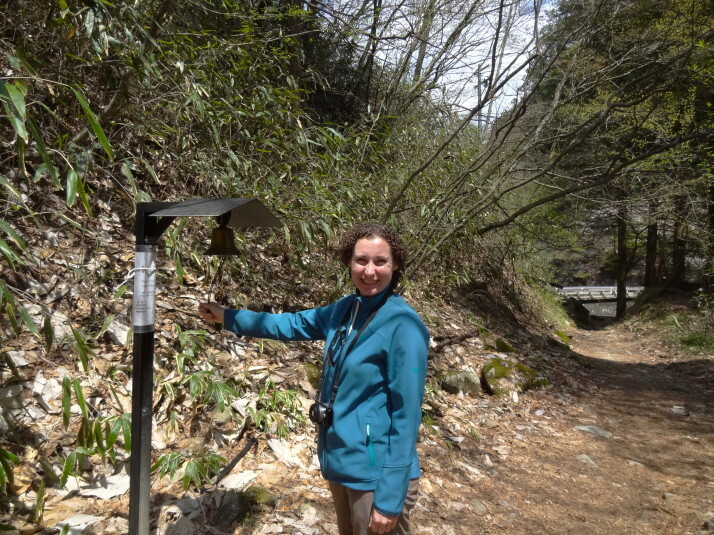 The pass marks about a third of the way between the 43rd and 42nd post road stations, and the Prefecture boundary of Gifu (Magome) and Nagano (Tsumago). The route is a lovely untaxing walk through forest and paddy-field farmland. There was plenty of beautiful sakura (cherry blossom), including a 250 year-old weeping cherry tree in full bloom. Surprisingly, we didn’t see much wildlife and we were a little alarmed at the frequency of the bear warning bells which Julie felt compelled to ring. I thought the bells might have had the opposite effect, sort of like a dinner gong, but despite ringing every one we saw, we still didn’t meet any..
With tired legs and in need of a ryokan, we arrived in Tsumago to find it a flatter, straighter, quieter version of Magome, having thoroughly enjoyed hiking the section of the Nakasendo. After exploring Tsumago’s main street of lovely lattice-fronted buildings, and sampling the regional delicacy of gohei-mochi – baked rice on a stick whose only redeeming feature is the sesame-walnut sauce, we retired to our ryokan, the Hanaya. After a well earned onsen (hot spring bath), we sat down to another amazing feast of Japanese food. 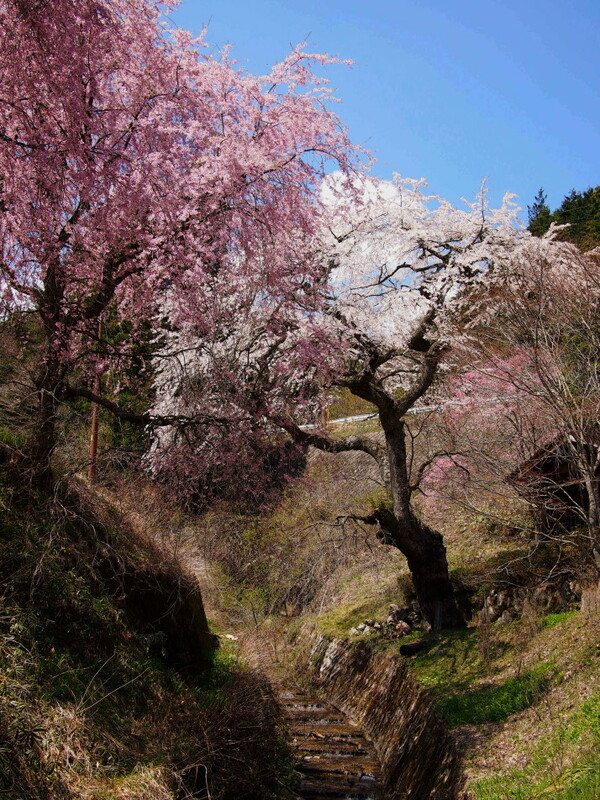 This entry was posted in Accommodation, Experiences, Places and tagged Japan, Magome, Tsumago on May 31, 2014 by Andrew.